Replace JJ Abrahms as director with Justin Lin, and suddenly this series drops to absolute dull and incomprehensible garbage. This movie is bad and dumb in all kinds of ways. The plot starts out too simple and ends up too complex. The action is uninteresting and not exciting at all. The characters and humor don’t hold our attention. There are some aspects of the movie that work, such as some interesting reflection at the start of the film, and some nice tributes to Leonard Nemoy, but these things are small peanuts in the grand scheme of the movie. This is what happens when JJ Abrahms is replaced as director with Justin Lin. It’s taking a mastermind wizard and replacing him with a shlock jock who is out to make money, and nothing more. 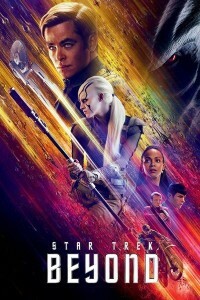 Star Trek: Beyond is a load of crap. It’s not an absolutely awful movie or anything like that, but considering how far this series has fallen since the first film in 2009, what we are being given now is in many ways a disgrace. The first two movies were directed by wunderkid J.J. Abrahms. They were both pretty great. The first one, in particular, was a masterpiece of creativity and humor, but even the sequel, Into Darkness, did a nice job of putting us on edge, with an element of mystery surrounding the villain. In Beyond, there is a very limited story and neither the jokes nor the villain work out all that great. Perhaps that’s because Abrahms is no longer the director. He turned the reigns over to Justin Lin, so that he could go on to direct Star Wars: The Force Awakens. Lin is the director of four Fast and The Furious movies. Three out of the four of them are pretty lousy. This guy directred Tokyo Drift, Fast and Furious (the 4th film), Fast 5, and Fast and Furious Six. Of those movies, the only one that was truly good was Fast 5, where the Rock was brought into the series. All of the others were dopey at best. Lin is not an especially talented director. With the Fast and Furious films, at least he was making B films, and there was something acceptable about them being kind of dumb. With Star Trek, Lin is touching on a series that is of a much higher caliber. This is the series that JJ Abrahms worked hard to set on the right track. If you hand it off to someone, then you hand it off to someone smart. Lin is a money maker for the studios, but not a whole lot more. With this movie, he is way out of his league. It’s like getting Joel Shumacher to follow up on the Tim Burton Batman movies. The two directors are so far out of synch that finding middle ground for them is an impossibility. Star Trek: Beyond opens with Admiral Kirk (Chris Pine,) offering some sort of object as a peace treaty to a bunch of strange looking monstrous creatures that sit high up, on the side of a cliff wall. The creatures don’t want it. They say the object was stolen. Kirk says it has been the property of Star Fleet, (the company where he works,) for ages now, but the creature don’t care. Then they attack him, turning small as they do. Say what you want about this movie, but the creatres are all pretty cool. That’s one thing that Lin did have fun with and get right. Making crazy looking, Star Wars style creatures. It turns out this artifcat will play into the story later. For now, Kirk’s voice over comes on telling us that they are in the middle of a five year mission, and some of them have had enough. They can’t tell the different between what is real and fake anymore, because, ” even gravity is atificial up here. Kirk wants to quit and turn over the operation to Spock. He feels like he tried his hand at this job for years and just couldn’t live up to his father. Spock wants to quit for other reasons. Admiral Spock, (Leonard Nemoy) has died, and that makes Spock realize that they are all mortal up here, in space, and that maybe starting a family and leaving this all behind is the way to go. I like some of the relection that happens at the beginning here, because it gives us a bigger picture to think about. We see the characters docking the Starship Enterprise Ship at a space station and town, and that’s where we learn a little more about what life has been like for them, including the relationships that some of them have formed with each other. Zulu, (John Cho,) for example, is now gay. We briefly meet his boyfriend and adopted child. We see a few other quick examples of relationships. But this kind of serious tone can’t go on for very long in a movie like this, and so the actual mission plot starts to kick in, and that’s where the problems start. At first, the characters are asked simply to help a ship rescue its crew, from a seemingly simple and harmless area. It doesn’t work out so smoothly. No sooner do they get close to completing their task, then does their entire ship get attacked by a force they had no idea was there. The attack comes from all sorts of small, spider like things that come flying at their ship. We never get a good look at any of these, despite them being everywhere. That could pretty much be a statement about the entire attack. It’s long, and they give us a lot, but it’s never interesting or handled right. It’s the kind of action scene that should be fun, only with everyone just firing lasers and no actual hand to hand combat, or real consequences of any kind, the scene actually ends up kind of dull and boring. That attack scene goes on way too long and ends with the Starship Enterprise spaceship blowing up. This is the best moment in the movie. It’s the one thing that this film got right. JJ’s thing, as a director, has always been to show us something about the characters that the series has never shown us before. Something that we might have been wondering about, even if we didn’t know it. In Mission Impossible III, Abrahms did this with Ethan Hunt having a wife and a personal life, outside of work. With Star Wars: The Force Awakens, Abrahms did it with seeing the backstory and life of a storm trooper. Here, since JJ is not back, the movie really doesn’t have any of these sharp insightful moments. The closest we get is seeing the Enterprise destroyed. After the ship is blown up into all sorts of pieces, character land in different areas on this new and mysterious planet. They find themselves in groups and pairings. Zahura and Zulu are with the crew. Kirk is with Chekov (Anton Yelchin, who died not long before this movie came out.) Bones finds a mysterious woman to join up with, named Kayla (Sofia Butola, the girl with blades for legs in Kingsmen: The Secret Service.) The pairing situation should be fun, if characters in pairs each encounter their own challenges. No such luck. Here, is the dullest part of the movie, with the only semi-exciting thing happening when Kirk and Chekov are caught in a cool looking trap. Only we don’t see the trap spring on them or see them get caught. All we get to see is the aftermath of it for one brief second. That’s pretty typical of this film and its missed opportunities. Idri Elba plays the main villain here, and you’d never know it to look at him. This is the case where too much makeup can be a problem, because it actually hinders Elba from being convincing about pretty much anything. 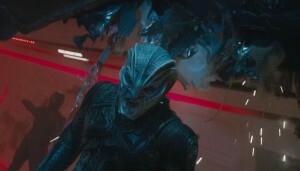 I do like the different creatures in this film, but maybe there could have been a combination of monster face and human face, where we could at least still tell it was Elba. On top of that, he’s a pretty lame villain. His story isn’t explained clearly enough, and whatever we do get is not something to really care about. Star Trek Beyond is a mess of a movie. It was written by Simon Pegg, who is hardly a mastermind of the movies. Pegg made a trilogy of great films under the direction of Edgar Wright, but the moment he stepped away from this director (to make Paul,) we got a look at what Pegg could do on his own, and it wasn’t pretty. The biggest loss, however, is J.J. Abrahms. Justin Lin is an action director and nothing more, and with this movie, he doesn’t even get that part right. The story is incredibly dumb, (they actually use music to destroy enemy ships,) and even the characters that were so great in the two movies that proceded this film now feel flat. There are some elements to like, such as the reflections at the beginning, and the tributes to Leonard Nemoy. At one point we even get a cool situation with a photograph of Nemoy back in the old days of the Star Trek TV Show. But with a lousy plot, a lack of humor, and characters that don’t pop like we are used to, this movie is pretty bad.